Today, we are headed to Mexico, but not just any part of Mexico, the Yucatan peninsula to be more precise, where the torta de cielo is originally from. Yucatecan cuisine definitely features its own unique style, which is quite distinct from traditional Mexican cuisine as we know it. It is obviously influenced by the Mayan culture but also the Caribbean, Spanish, African, as well as Middle Eastern cuisines. What makes this cuisine different are ingredients locally grown ingredients like pumpkin seed, oregano, red onion, sour orange, sweet chili, tomato, achiote, xcatic chile, and habanero pepper. Turkey (pavo), chicken (pollo) and pork (cerdo) are the main proteins. Also, the long coastline of the Yucatan peninsula provides excellent seafood that are featured in numerous local specialties. Pumpkin seeds, for example, are used in a very traditional Yucatecan dish called papadzules. These local delicacies are similar to enchiladas. 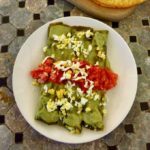 They actually consist in corn tortillas that are dipped in a sauce of pumpkin seeds (pepita), filled with hard-boiled eggs, and topped with a tomato and pepper sauce. Pibil is a another traditional dish consisting of marinated meat that is wrapped in banana leaves, then cooked in a barbecue pit. Cochinita Pibil is the most common version that is prepared with a whole suckling pig. 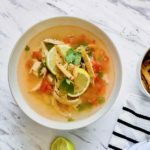 Sopa de lima, the only Yucatecan recipe we have featured on 196 flavors so far, is a deliciously refreshing citrusy chicken soup that really represents the cuisine of this beautiful region of Mexico. 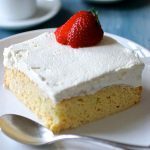 And among all these delicious specialties, I chose to prepare a very unique cake called torta de cielo or heavenly cake, which is said to have originated in the kitchen of a well-known hotel in the city of Mérida in the state of Yucatán. 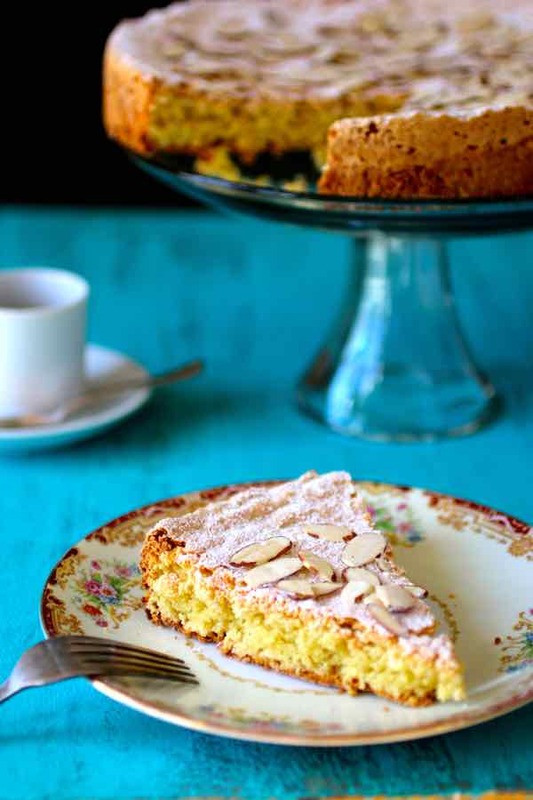 This almond-based cake is particularly airy and light, and it definitely deserves its name! Over there, this cake is traditionally served at weddings and first communion receptions. 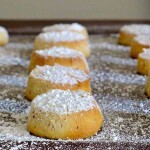 Torta de cielo is a very intriguing cake as it is made with almost no flour. Although it doesn’t rise too much, the leavening agents that allow this cake to be so light are the eggs and the baking powder. 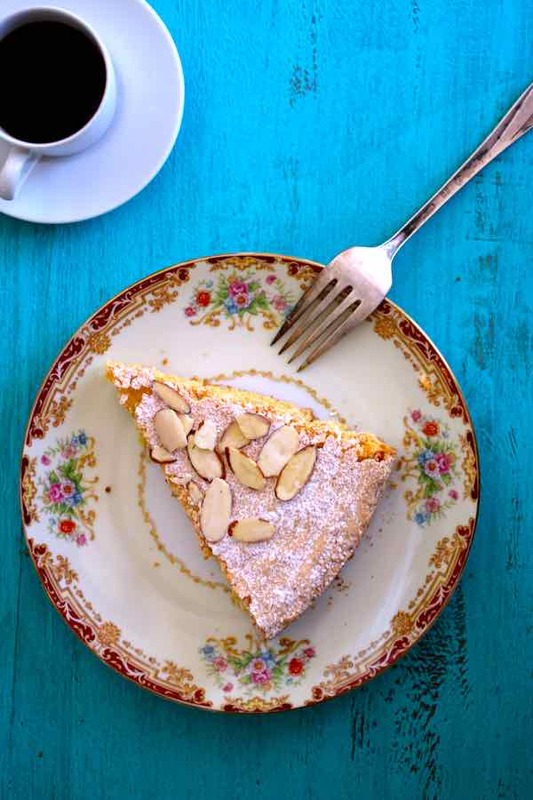 If you like almonds, then this cake is for you! Did you know it: almond is a nut that is really the hard-shelled fruit of the almond tree. This stone fruit is of the same family as cherries, plums, peaches as well as nectarines. But how did this nut make it to the Yucatan peninsula? Almonds are originally from the steppes of central Asia. They started to be traded on the silk road between Asia and the Mediterranean. Soon after, almond trees were flourishing in the Mediterranean, especially in Spain and Italy. They are a very important ingredient in Arab cuisine and pastries in particular. We have already used them in recipes such as cornes de gazelle, maamouls or pastilla. Marzipan, a sweet almond paste confection, was actually introduced by the Arabs to the Western world during the Middle Ages. They arrived to the American continent thanks to the Franciscan missionaries, who started planting them on the California coast in the 18th century. However, the growing conditions were not suitable and they eventually started to be grown commercially in Central California and the Southern States of the US. Throughout history, almonds have always important religious, ethnic as well as social significance. In the Bible’s Book of Numbers, you can read the story of Aaron’s rod that blossomed and bore sweet and bitter almonds, thus giving almonds the symbolism of divine approval. The Romans used to throw almonds at newlyweds as a fertility charm. Today, several countries around the world give a pouch of Jordan almonds (sugared almonds) at weddings. They represent children, happiness, romance, good health and fortune. In Scandinavia, and in particular in Denmark with its risalamande, the almond which is placed inside this Christmas rice pudding is supposed to bring good luck to the person who finds it. 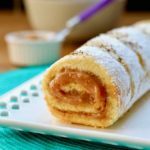 Beside the French galette des rois, which also has religious significance as it is a traditional Christian Epiphany cake, there are numerous popular and traditional almond cakes around the world. Among them is the famous tarta de Santiago (Santiago almond torte), named after the Galician city of Santiago de Compostela in Spain. Actually, a number of almond cakes made their way to Latin America with the Spanish and Portuguese explorers. For some reason, a number of such almond cakes started to include the word “heaven” in their names like in torta del cielo, or the Cuban almond cake called tocino del cielo (bacon from heaven) or its Brazilian equivalent, toucinho de ceu. A number of historians believe that these cakes were first made religious institutions such as convents, which would explain the naming. And let’s not forget polvorones, those deliciously crumbly Spanish shortbread that have also made their way to Latin America. Most of the traditional versions of torta de cielo have no or a small amount of flour. Some add condensed milk. Some use flavorings such as brandy, others vanilla or almond extract. 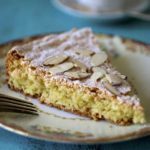 In any case, this cake remains a deliciously light and airy pastry that will satisfy all the almond lovers out there. And although it is not 100% gluten-free, I will definitely try to make it without the tablespoon of flour next time. 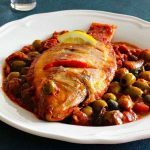 This recipe is validated by our Mexican culinary expert Mely Martinez from Mexico In My Kitchen. Torta de cielo is a particularly light almond-based cake that is traditional from the Yucatan peninsula region of Mexico. Combine the ground almonds, flour and baking powder. Beat the egg whites while gradually adding the sugar. Add the Brandy (or vanilla extract). Stir the egg yolks one by one, and then incorporate the dry mixture with a spatula. Grease a 9-inch round cake pan or springform pan. Lightly grease the pan with oil spray, then dust it with flour and tap while holding the pan upside down to remove excess flour. Pour the batter into the pan and bake in oven for about 45 minutes. Wait about 10 minutes before unmolding it, then cool completely on a rack. 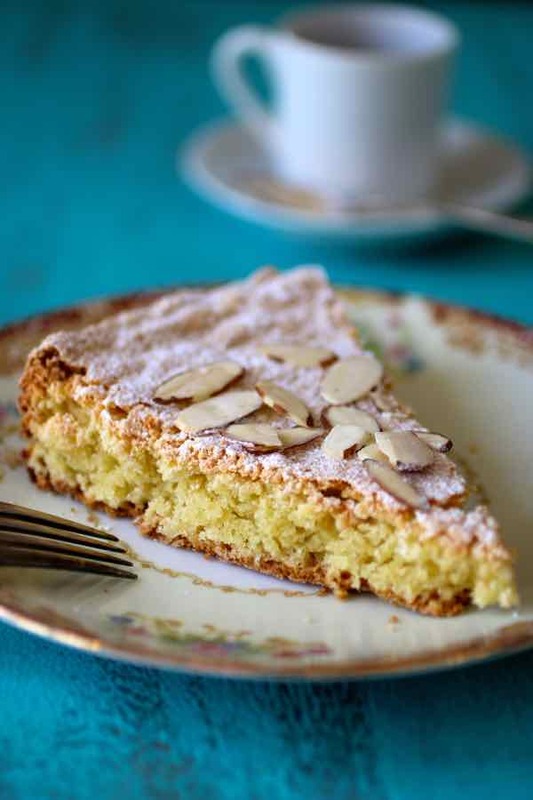 Sprinkle with icing sugar, then thinly sliced almonds. I just made the torta for my husband’s birthday yesterday (at his request) and he absolutely loved it. Well, he loves almonds too. Thanks for this great recipe.